You all continue to impress us! Last week was a tough run because most of the second half was uphill. You all did it so amazingly well! we will be bringing the gels again this Thursday. Bring water! Try a different gel and then go out and purchase a few of your own. We will keep bringing our stash until it runs out but you will need gels for Canary Wharf and Kew as well as the race. You will want to have two for the race just in case. Tuesday is a big day! Please stop by Kathy’s house at 15 St. John’s Wood Terrace which is near the corner of SJW High Street (a few steps from Starbucks) some time between 8:30-11:00am. THANK YOU Kathy for letting us invade your house! We’re collecting money (cash only) for shirts, hats, and all outstanding items for the Utrecht trip. We’ll also be handing out the apparel. The dinners and tours are requiring large deposits so we’re trying to simplify things for everyone by doing the collection now. Also please note that after this date we can not make refunds on the meal or tour costs if you need to cancel later. IF YOU CAN’T MAKE IT AT THAT TIME ON TUESDAY, PLEASE GIVE YOUR MONEY TO A FRIEND TO BRING AND TO COLLECT YOUR KIT. The costs are listed below. Attached to this email you will find the list of the Nike apparel order and the total Nike costs you owe. Just add that amount to the race costs that apply to you and you’ll have your total. On Tuesday. we’ll have a master list of the amount everyone owes, but it would be helpful if you can bring the correct change. Thanks so much! I know you all know this, but we have just over a month until race day and we have 3 longs runs left. You all are amazing and you ALL can do this. Don’t worry about the times and the distances – they are long but we are in this together and we will DO THIS! I know there has been some concern that we aren’t running enough. If you are feeling antsy and want to do a VERY short 30 min run on some other day, that is OK. But nothing more. I don’t want any injuries from overuse. It may be better to try to do some other cardio (biking, swimming, spinning) so you don’t mess up your running muscles. I know it seems strange to not run the full 13 miles before the race but truly this is how most runners train. The regular M/W/F group is running to Kew the same week we are and that is their longest run, just like us. If you think about it, each week we are adding about a mile to our long runs. Each week the run seems long, but it is also doable. You know you can do just that extra bit. And for the race, it will be the same. If you are feeling stressed about it, please talk to any coach. We have all run several races and have all trained in this way and we are happy to talk to you about it. Some runners complain that parts of the canal are very ugly. This is true. However, I enjoy seeing the transition from city and the older buildings along the canal and newer gentrified condos to the industrial parts to the country parts, with glimpses of Wembley Stadium along the way. I feel like it’s the real London – many sides, not always so pretty but always something to look at. And as you keep going, it changes. No, not the stadium but the streets. There is a large Hindu population and there are many shops with brightly coloured saris and trinkets that are fun to look at. And there is an amazing Hindu temple that was built in 2010 that took 14 years to build from stone from India. It is incredible. Look for it on the left hand side of the street. Once we get on the canal, we run for about 6 miles. I believe this will be the longest stretch of uninterrupted running you will have had so far. One of the things that makes me love this run is that it was on this part of the run in my beginner year that I had a running epiphany – I felt like I could just keep running forever. I think I had settled into that pace where you feel good, you feel like you’re just cooking along and you can chat and run and all is good. I hadn’t really felt like that before and it was a great feeling. Some of you may have already had that feeling, some may never get it, but having a nice long uninterrupted stretch may put you in a similar place. I hope so! 4) You get to say you ran to Wembley! Most people have heard of Wembley. And people in London know it’s a ways out. So it’s fun to be able to say you ran there – so impressive! Start out heading west on Circus Road, turn left on Grove End to St John’s Wood Road and go west, turning left on Cunningham then right on Aberdeen to work your way to the canal entrance on Blomfield. Continue out the canal and exit at Alperton, see photo below, not quite 7 miles in. Turn right at the top of the stairs, cross the bridge and take the first right onto Ealing Road. Just after the turn you’ll see the Alperton station on your left. Follow Ealing Road to the High Road and turn right. You’ll see Wembley Central on your right for the 8-mile route. 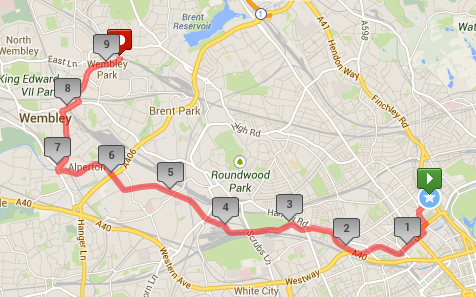 For 9 miles, continue until you make a left on Park Lane which becomes Wembley Park Drive. Continue past the turn off to the stadium on the right and up to Wembley Park Tube Station. There is a Costa just down the steps towards the stadium so we will head there for coffee afterwards for those who can stay.